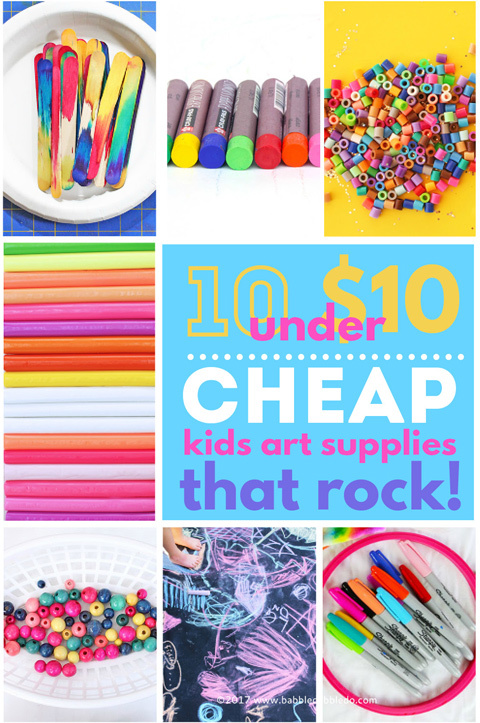 You are here: Home / Art for Kids / 10 under $10: Cheap Kids Art Supplies That Rock! 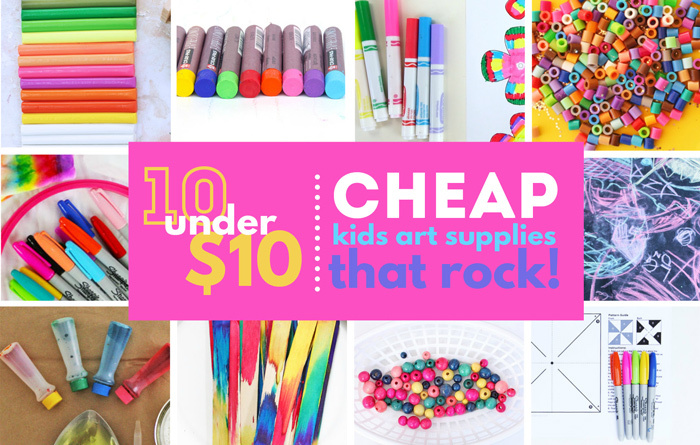 10 under $10: Cheap Kids Art Supplies That Rock! A big challenge for many families who want to do more creative activities at home is the looming cost of kids art supplies. I mean when was the last time you walked out of Michael’s and couldn’t believe how much money you’d just spent on supplies for ONE PROJECT? It’s easy to go overboard when faced with lots of inspiring project supplies and the enthusiasm of an upcoming project. But after the project is done and the supplies go into a storage bin and are forgotten you may ask yourself was it worth it? Could you have spent that money on something else your family needs? Listen, I know creativity is a priority to you, so when you do choose to spend your hard earned money on materials you want them to be quality supplies that you will use over and over again, not one-off costs. With that in mind I put together a list of our family’s favorite art materials that are all under $10 and that we use on a regular basis. 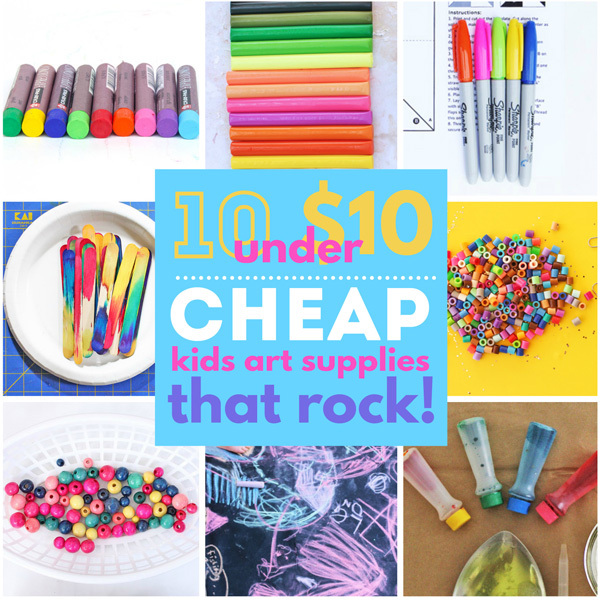 All of these cheap kids art supplies find regular rotation in our projects and creative tinkering. This page contains affiliate links. I receive compensation for purchases made through my site. I cannot say enough good things about having cardstock on hand! Cardstock is thicker than regular paper so it’s perfect for paper folding projects and painting because it absorbs liquids better, plus it is far cheaper than specialty watercolor paper. The BEST DEAL on cardstock is online here. Trust me, it’s three times the price if you purchase it at an office supply store. Oil pastels are a great alternative to crayons. They glide across paper like “butter” and have wonderful vibrant colors! NOTE: These are permanent makers! They will bleed through thin paper onto surfaces below. Also they are not best in the hands of toddlers who may use them to write oh, I don’t know….on the walls! We learned this from experience. Supervision is suggested! We love Sharpies in our house because they have bold colors, are long lasting and durable, and have the perfect sized tips for drawings large and small. At first glance you may cringe at the site of so many little beads that can go everywhere…but wait, give them a chance! Perler Beads ( AKA Hama Beads) are fusible when ironed so kids can use them to create amazing designs and creations that last. A bucket of these happily kept our Girl Scout troop busy for a good 30 minutes and they all asked to do the activity again! I love having these on hand just for mixing paints, glues, candy, and any concoction you can think of…BUT they re also wonderful for projects themselves! Every family should have a set of washable markers on hand especially if you have little ones in the house! Hand your child a stack of paper and markers any time you are in a rush to find something to keep them happily busy. The fact that they are water soluble makes them perfect for a number of science art experiments as well! A staple for warm days outside! Kids never tire of drawing on a driveway or the patio, even outdoor furniture (if you let them…). I usually leave a basket of chalk outside for the kids at all times. These wood beads are perfect for a variety of projects and the large hole size makes them easy for kids to string. Plus they come in cheerful, bright colors! I always seem to find a gazillion ways to use them. Yup, they stuff you pick up at the grocery store! It’s cheap, has a gazillion use for coloring things like play dough, homemade paints and oobleck and the teensy squeeze bottles are perfect for little hands. A step up from food coloring is liquid watercolors and this starter set at Blick Art Supplies is also under $10. Here are 5 more inexpensive project supplies I like to have on hand at all times! One of the biggest lessons I have learned from doing creative projects at home with my kids is to stop wasting my money buying one-off project supplies. I try to buy supplies that can be used for multiple projects and that are open-ended enough to be used for art, science and engineering projects. Another tip I have is to stay away from “discount” version of kids art supplies. I’ve spent money on giant “kids art kits” only to discover that the supplies were of low quality and usable only a few times. Good quality supplies don’t have to break the bank, you just need to know which ones are affordable to begin with and that your family will find uses for many times. I hope this list of our family’s favorite art supplies inspires you to stock up on supplies even on the tightest of budgets! Thanks, that’s a great list. I work with homeschool families, grades K-6 and we are always looking for good deals. We have used your fun crafts and science books. Yay!!! What are your favorite supplies to recommend? Way ahead of you. There are ways to cut costs, especially being a teacher with the freedom to create learning environments for students. Your list is spot on. When it comes to glue I purchase the gallon container and refill smaller bottles when ever possible. A good funnel is helpful. YES! I totally buy the big gallon of glue and refill 🙂 I’d love to hear more of your tips Zoraida! Cool list, thanks for sharing. We got our daughter an aquadoodle recently and that’s really good too! (it avoids any drawing on walls which we have experienced recently!). We love Aquadoodles! Great suggestion!